Let’s talk about how you’re perceiving colour. The idea came to me when a coworker asked if they should get the computer with 100-per cent sRGB or 100-per cent Adobe RGB, which displays more shades of green. I jokingly told him to take this X-Rite colour perception test to see if he could even perceive colour well enough for the more expensive Adobe RGB display. He could — but some people can’t! The people producing everything from your TV to your phone display are competing to try to produce more colours more accurately. Which means that now, more than ever, it’s a good idea to know how well you perceive colour. If you’re colourblind or have a colour perception deficiency you may not need to worry as much about claims of wider colour gamuts. If you’re any a hurry you can take the test above, which has you arrange 40 coloured blocks along four rows in order of hue. But if you want to really test out your eyeballs and see where your own deficiencies lie, take this much harder test that has you match 72 blocks of colour by hue. 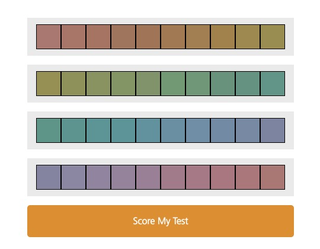 With either test, a “0" score suggests you have perfect colour vision, but in the second test it’s a lot harder to get that score. In fact not one person in the Gizmodo office could get it on their first try. This comes down to a few factors. First there’s simple eye fatigue. Staring at the test for a long period of time is going to wear your eyes out and make it hard for them to see differences in the hue of the blocks. Next there’s the limitations of those rods and cones in your eyes that let you see stuff along the colour spectrum from red to green to blue. Human vision tends to perceive some colours — specifically those along the red and green spectrum — a lot better than other colours (like those along the blue). This is why we get grossed out when skin tones are reproduced too poorly on a TV or the green of grass seems unnaturally too green in an image. It’s also why we like displays with more blue in them — even when they’re inaccurately reproducing colours. We have more trouble seeing the blue so it is often more pleasing to our brains! But because our eyes have more difficulty with colours along the blue spectrum, it can make matching the blocks with more blue in them more difficult. And if you have a colour perception deficiency it will be even harder. X-Rite even claims that cismen tend to have more difficulty differentiating colours than ciswomen, with one out of every 255 women and one out of every 12 men having some kind of deficiency in colour perception. The third issue probably isn’t as common and relates to your display. Different types of displays produce colour differently. OLEDS, LEDS, and quantum dot displays all have their own unique signature on the colour spectrum. As these displays improve and recreate more colours, they become more exact with their colour reproduction. That’s really good! But it also means that some displays, particularly quantum dot ones, can be almost too good and the colour they produce is on so narrow a spectrum that you and I might see the same colour differently. Here’s how I wrap my head around the concept: I think about a very thin line and how that line can sort of look wider or narrower depending on where I’m sitting. Colour can be the same way (it’s something called metamerism). If the part of the spectrum the colour is produced on is too narrow, you and I may see it differently, which could fudge our results with the test above. If you find yourself netting an easy “0" score then go ahead and splurge on the fancy displays. But if you’re failing either test, then... maybe you don’t need to be as excited about the new world of wide colour gamut displays.